Blow Engineering began its journey of incandescent growth in 1986 by manufacturing and exporting exceptional range of Blow Molding Machines, Liquid Container Machine, Plastic Scrap Grinder Machine, Broom Handle Making Machine, Flexible HDPE Pipe Making Machine, Lubricant Station Making Machine and Hydraulic Deflashing Machine. Owing to high durability, superior finishing, dimensional accuracy and longevity, these products are heavily demanded in the market. Widely used in Chemical, Automobile, Lubricant, Edible Oils, Pharmaceuticals and FMCG we fabricate these products by using fine grade plastic, rubber and cutting edge blow molding processes. We are always ready to provide customized solutions for the Plastic Blow Molding Industry. We also provide turnkey projects as per requirements. Due to these aspects, we have able to surpass our competitors in terms of quality, innovative technology, and ethical business skills. We have developed leading-edge infrastructure system for fabricating our wide range of products with maximum perfection. We have implemented advanced production lines for manufacturing of these products by using modernistic machines of blow molding processes. On top of that, we have developed a quality testing unit for inspection of these products under strict quality control parameters. With the use of skilled engineers, we design these products in various stipulations as per latest industrial standards for serving diverse needs of clients. Our veritable goal of attaining maximum clients’ satisfaction has gathered our vast customer base to serve. We have garnered a huge list of clients all across the globe, including regions such as Gulf Countries, African Countries, Sri Lanka, and Bangladesh, etc. For our firm, Mr. Mohammad Rizwan (Business Development Manager), is the highly regarded person of the industry. In his assistance, we have marked a special place in the industry with his hard work & efficiency. 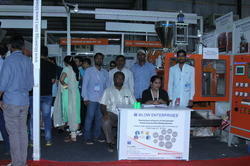 Thereby, we remain at the top position in the market of molding machines. Since our commencement, we employ a team of conscientious professional who have the wide prowess of this field. Our team comprises of adept designers, production engineers, quality controllers, management professionals and other subordinates. Our large team of professionals has profound expertise in its respective domains. For ensuring manufacturing of products to be carried out as per clients'''' laid specifications, our team works in close vicinity and co-ordination with each other. Our company is able to serve diverse demands through our efficient management personnel. Quality assurance is our foremost offering to the valued clients. The team of quality control professionals is always engaged in stringently testing the products during the inspection process. By using various testing measures, the company ensures that only the best quality products reach to the clients. Setting up high-quality standards in the company, Blow Enterprises® strives to achieve complete customer satisfaction. We have state-of-the-art infrastructure and our facilities are spread over an area of 3000 sqr. ft. Our manufacturing unit, well equipped with modern machines and advanced equipment, assists us in producing products as per the clients’ needs. Besides, we have Testing Facilities, R and D Facilities, Customized Packaging Facility, and CAD (Computer-Aided Design)/CAM (Computer-Aided Manufacturing) Facility available. We have recently set up an additional manufacturing hub at VASAI in order to speed up the production, hence felicitating on time delivery to our esteemed clients and customers. Owing to these aspects, we have been to serve bulk demands of our customers with ease. After supplying to more than 20 States in India, we have garnered a huge list of clients all across the globe, including regions such as Kuwait, Sri Lanka, Bangladesh, UAE, Kenya, Nigeria, Ethiopia, Burundi, Malawi etc. Owing to our ethical business practices and transparent dealings, our clients have bestowed upon immense trust on us. Plastic Packaging and many more.